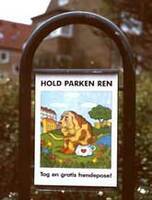 The UK is a nation of dog lovers and taking your dog to the park has the almost the status of a human right. Since the 1990s it has been increasingly managed. Owners often asked to carry a polythene bag and use it to collect any excrement their dog leaves. In France, dogs have traditionally been banned from urban parks. In the USA, there are special 'dog parks' where owners are allowed to exercise their dogs.